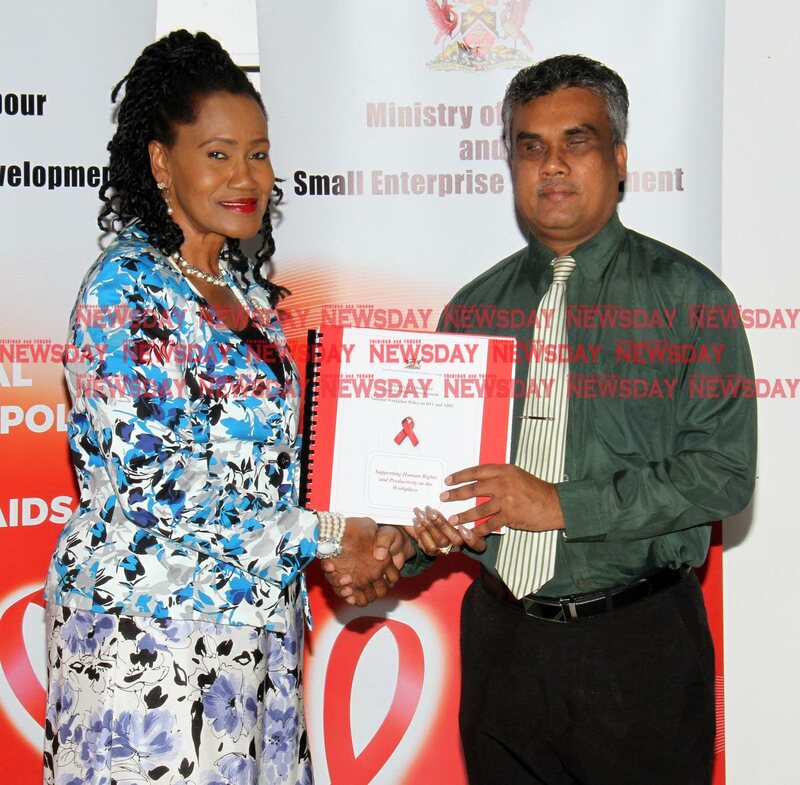 Labour and Small Enterprise Development Minister Jennifer Baptiste-Primus formally handed over copies of the National Workplace Policy on HIV and Aids, and an employee brochure document in braille, to Kenneth Surratt, executive officer of the Blind Welfare Association (TTBWA) and Catherine Romain, executive director of the National Library and Information System Authority (Nalis), at the atrium of the National Library, Port of Spain on Friday. Saying he knows only too well of discrimination suffered in the past, he said having the policy gives his association the opportunity not to discriminate against those with HIV/Aids, and that they were happy to be part of the drafting of the policy in braille. Referencing printed work and the Copyright Act, Surratt said: “We are asking the minister, please encourage the AG to have that legislation amended so printed work could be accessible to the disabled. Once we amend that copyright law, immediately, over 500,000 books will be available in an accessible format for the vision-impaired. She then lauded the work of the association, which she described as a contribution of indelible magnitude to society, making it possible for many to gain education and equip themselves for numerous tasks and do jobs in various workspaces, both in the public and private sectors. The policy provides guidelines for managing the impact of having an infected employee in three ways. The first is committing the workplace to take action; two, laying down a standard of behaviour for all employees (whether those employees are infected or not) and defining the rights of all; and giving guidance to managers and workplace representatives. Baptiste-Primus said: “I urge all our stakeholders to take the opportunity to work with us in improving workplace environments and increasing productivity and making the overall work experience one that is safe, healthy and enjoyable for all involved. “The time for inclusivity within the workforce is now and the ministry aims to ‘promote sustained, inclusive and sustainable economic growth, full and productive employment and decent work for all’ in keeping with the UN’s Sustainable Development Goals. Earlier Natalie Willis, permanent secretary in the ministry, said when the policy was launched in 2017 it was with the intention to support productivity in the workplace and the right to work under the ambit of the Decent Work Agenda. Reply to "Blind, disabled part of society"